Leo Rosenthal was born and raised in Washington, D.C. He received a degree in biology from Columbia Union College in Takoma Park, MD. and his dental degree from the University of Maryland in 1972. Leo has practiced general dentistry from graduation till the present time in Alexandria, VA.
Dr. Rosenthal is a member of the American Dental Association, the Northern Virginia Dental Society and a pre-fellow in the Academy of General Dentistry. He is a past dental restorative instructor at the University of Maryland. He currently lectures on the latest resources available to the general dentist, including dental materials, aesthetics, and computer technology. Dr. Rosenthal's passions are his family, dentistry and boating. "I would like to give credit to my wonderful staff (Tina, Jessica, Jenny, Dani and Lindsey) who have made it possible for me to deliver the best for the best." The office of Leo Rosenthal, has been consistently singled out by "CHECKBOOK" magazine as one of the best in dental care delivery. 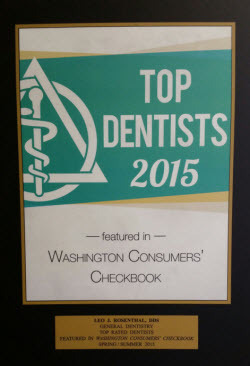 (2015 edition "Best Dentists in Washington"